Yall So Stupid was an alternative hip hop group based in Atlanta, Georgia. It was formed by H2O, Unkle Buk, Sha Boogie, Spearhead X and Logic in 1991. After performing extensively in Atlanta’s underground circuit, the group was signed by Dallas Austin & L.A. Reid to Rowdy Records in 1992. Their debut album, “Van Full of Pakistans”, was released on May 25, 1993. Later that year, the group was released from the label. In 1995, H2O formed the group Massinfluence with Audessey, Cognito and Spearhead X. They released an album in 1996 entitled “The Underground Science”. They recorded a second album, called “Intellect Street Music”, which was not released; the group broke up in 2002. In 2009, H20 formed the duo H&P with DJ Pocket of Atlanta. They recorded an album entitled “Stay In Your Lane” which was set to be released in 2010. Unkle Buk records music under the alias Willy Snypa as part of a group called Da Goldminerz. Yall So Stupid is currently planning to release their second LP, although a date or a possible title are not yet known. 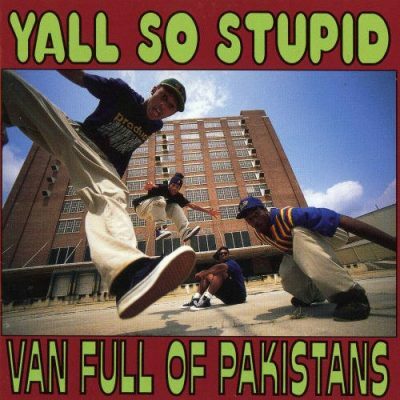 comment "Yall So Stupid – Van Full Of Pakistans (CD) (1993) (FLAC + 320 kbps)"